Showtime hosts programs and events related to film and television. These include the weekly Blockbuster and Late Night Film Series, advanced movie screenings, TV premieres, trivia nights, sing-alongs and interactive events. Showtime also hosts the annual Texas Union Film Festival (TUFF) to celebrate student filmmakers at UT. Showtime invites you to take part in the annual Texas Union Film Festival! TUFF will challenge, entertain and move you. The event showcases and celebrates the rich tradition of student filmaking at the University and seeks to connect students with the Austin film community. Call for Submissions: Are you TUFF enough? Showtime is proud to present the 10th Annual Texas Union Film Festival on Thursday, February 28 and Friday, March 1, 2019. Join us in the TEXAS UNION THEATRE (UNB 2.228) at 7:00pm for an introduction of our guest judges, our official selections' film screenings, and the awards presentation. Films for the competition should be under 10 minutes in length. Exceptions to the length may be made on a case-by-case basis. Films must be submitted on a USB drive or DVD. The short must be filmed off of the UT campus unless made for an academic course. Films up to two (2) years old may be used. No work from high school will be accepted. Each student may submit more than one film, but only one may be selected to be screened at the festival. Submission forms can be picked up at the Campus Events + Entertainment Office (UNB 4.312) starting on November 1, 2018. Films must be submitted to the E+E Office in person by Februrary 14, 2019. Any UT Austin undergraduate or graduate student registered for the Spring 2019 semester. How many times and where will my short be shown publically? The TUFF official selections will be shown once in the Texas Union Theatre (UNB 2.228) during the Texas Union Film Festival. What are the content criteria for the shorts? 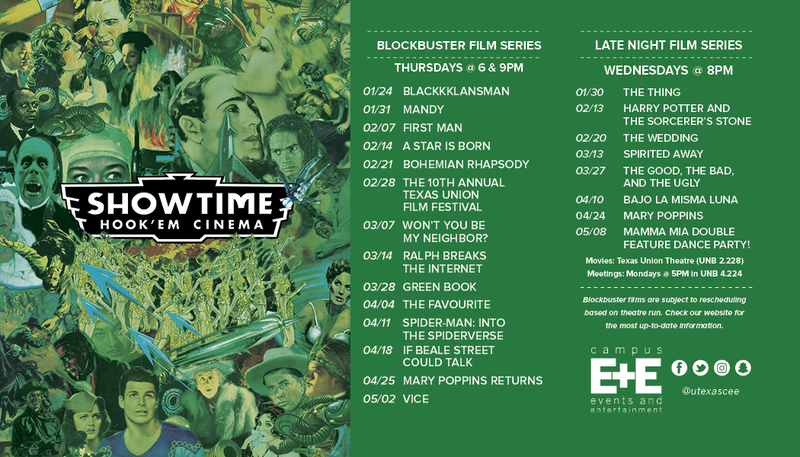 E+E Showtime will review each submission and select the best films to screen at the competition. Content will be accepted/rejected at the committee’s discretion. Films will be evaluated based on merit in narrative storytelling, technical achievement, creativity, and originality. What are the time constraints for the short? Films should preferably be under ten minutes in length. Exceptions may be granted on a case by case basis. Each student can submit more than one film, but only one may be selected for screening. Where may I film the short? All film submissions must be shot off-campus unless made for an academic course. No. But there are prizes for the winners! Past prizes have included credentials to SXSW Film, the Austin Film Festival, and Fantastic Fest. How old can the short be? Films may be up to 2 years old. E+E Showtime will not accept submissions made during high school. What info must be turned in with the short? Download this year's submission form (TUFF Submission Form-updated.pdf). Enclose your film on a DVD or USB drive along with the submission form in a plain envelope. The envelope should have the director or submitter’s name and contact information on the outside. Where should the short be turned in? Submissions must be turned in at the front desk of the Campus Events + Entertainment Office in the Texas Union (UNB 4.312). Judges include faculty from the Radio, Television, and Film Department, members of the Austin filmmaking community, and notable UT alumni. Whose property is this short? The short is still your property, but is being shown by the University with your consent (as stated on the submission form). Will I get the short back? The shorts will be available for pickup starting the Friday after TUFF at the Campus Events + Entertainment Office (UNB 4.312). Your UT ID must be shown to pick up your materials. How long do I have to pick up my USB Drive or DVD/CD? The shorts will be held until the last day of classes. They will be disposed of after then. If I have any additional questions, who can I get in touch with? Please email studentevents@universityunions.utexas.edu or call 512-475-6630.